The XOS 2 is designed with high agility. It can climb stairs or ramps, use a punching bag, or play a with a football. Image courtesy of Raytheon Company. 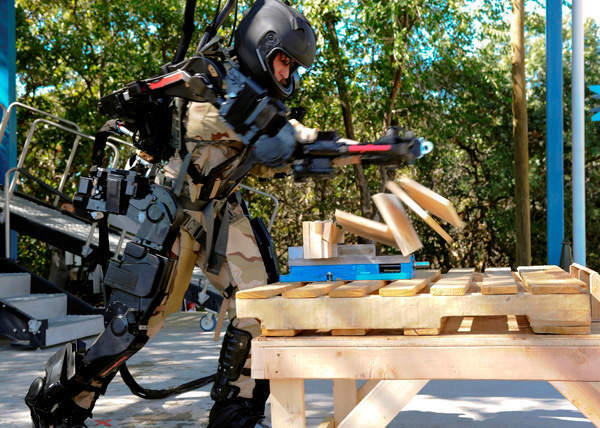 A soldier wearing Raytheon's XOS 2 punching through some wooden blocks during a public demonstration at the research facility in Utah. Image courtesy of Raytheon Company. A soldier performing push-ups during the demonstration in Utah. Image courtesy of Raytheon Company. 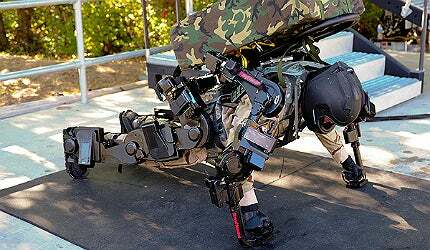 XOS 2 is a second-generation robotics suit being developed by Raytheon for the US Army. The company publicly demonstrated the capabilities of the exoskeleton for the first time at its research facility in Salt Lake City in Utah, in September 2010. The wearable robotic suit increases the human strength, agility and endurance capabilities of the soldier inside it. The XOS 2 uses high-pressure hydraulics to allow the wearer to lift heavy objects at a ratio of 17:1 (actual weight to perceived weight). This allows repeated lifting of the load without exhaustion or injury. "The second generation XOS 2 robotic suit uses lighter material and is about 50% more energy efficient than the XOS 1." The US Defense Advanced Research Projects Agency (DARPA) initiated development of the exoskeletons in 2001 under the Exoskeletons for Human Performance Augmentation programme. The agency funded $50m to various participants under the five-year programme. 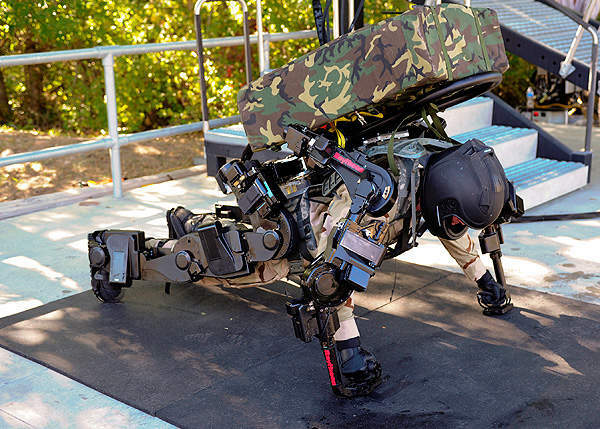 However, only two of them have been active in developing the exoskeleton prototypes for the US military. The XOS system was originally developed as the Wearable Energetically Autonomous Robot (WEAR) by Sarcos Research of Salt Lake City, Utah. Development of the biomechanical robot was started in 2000. The company, established in 1983, was acquired by the defence contractor Raytheon in November 2007. 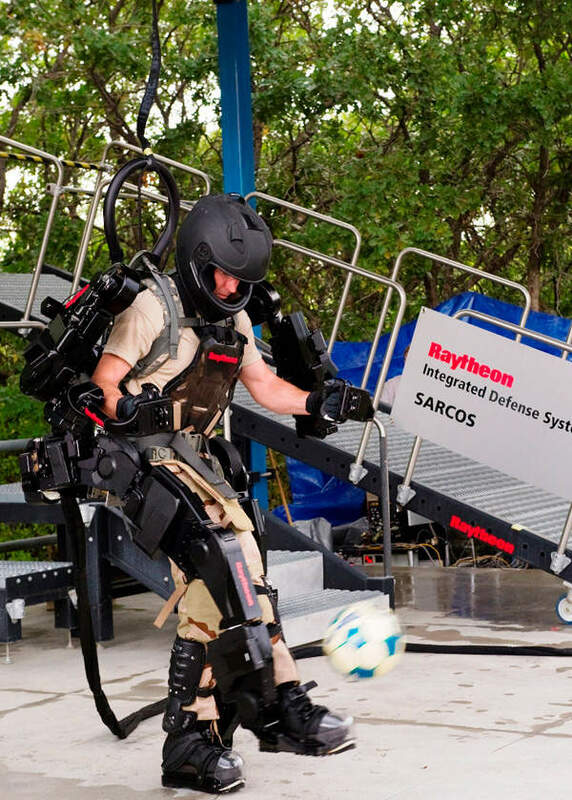 Sarcos is expected to have received about $15m in funds for the research and development of the WEAR, the initial proof-of-concept for the Raytheon’s first exoskeleton prototype, XOS 1. It was unveiled in 2008. A fully operating tethered XOS version is expected to enter into military service by 2015. The untethered version is not expected to be operational until 2020. The other exoskeleton is Lockheed Martin’s Human Universal Load Carrier (HULC), initially developed as the Berkeley Lower Extremity Exoskeleton (BLEEX) by the University of California, Berkeley. The second generation XOS 2 robotic suit uses lighter material and is about 50% more energy efficient than the XOS 1. The exoskeleton is expected to weigh about 95kg. It utilises a combination of controllers, sensors, high-strength aluminium and steel which allow structures and actuators to perform the tasks. "The US Defense Advanced Research Projects Agency (DARPA) initiated development of the exoskeletons in 2001 under the Exoskeletons for Human Performance Augmentation programme." Flexible hoses ease the fluid movement and allow smooth and efficient operations. The exoskeleton suit offers improved manoeuvrability and agility over the XOS 1 version. It is also more resistive to environmental challenges. The Raytheon Sarcos robotic system can take on the weight of the payload on one foot through the powered limbs. The wearer can lift about 200lb of weight for long periods of time without feeling the strain. The soldier wearing the suit can walk, run and can readjust to keep the load off the wearer, even upon stumbling. The exoskeleton is robust and allows punching through three inches of wood. It is also highly agile and does not bog down the wearer while climbing stairs, ramps, using a punching bag or kicking a football. The company is currently focussing on the logistics support variant. Continuous lifting of heavier objects by the military soldiers can lead to orthopaedic and other injuries. On average, the logistic and support military personnel are estimated to lift about 16,000lb of load a day. The robotic suit will ease the logistics problems faced both in the theatre and off the field. The soldier wearing the XOS 2 exoskeleton can perform the work done by up to three soldiers. It will, therefore, ease the challenges and reduce the costs and manpower requirements. The suit is also expected to be used for more strategic missions. Raytheon Sarcos also plans to develop several variations, based on the customer requirements and mission possibilities. The XOS 2 system is powered by an internal combustion hydraulics engine with electrical systems. The prototype is tethered to the hydraulics power source by a wire. The engine drives the hydraulic actuations. The various sensors equipped throughout the system specify the position and the force required. Computer processors are situated at every joint of the suit. Sensors send signals to the processors through ethernet. This further prompts the actuators to deliver about 200kg of force per square centimetre using pressurised hydraulics. It enables the soldier to lift 50lb with each arm. Raytheon Sarcos is planning to develop a fuel-carrying backpack with custom hydraulic servos for providing endurance of about eight hours. It will allow mobility and gait of the robot in combat environments. Use of hydraulics as the power source, instead of lithium ion batteries, eliminates the risks of breach and explosion. Vitavox has supplied worldwide defence organisations with loudspeakers, handsets and microphones since 1931. Vitavox, now a division of Secomak Ltd, continues to be one of Britain's true remaining defence communications manufacturers of rugged specification audio equipment. Vitavox main broadcast and Intercom loudspeakers are both current stock items for Royal Navies of UK, Australia and New Zealand. The defence standard in service command and control.